Apparently the paparazzi already knew about Tiffany Tang (唐嫣) and Luo Jin’s (罗晋) relationship before the two decided to go public. The two confirmed longtime rumors about their relationship on Tuesday, when Luo Jin shared a photo in celebration of Tiffany’s 33rd birthday. Tiffany replied to Luo Jin’s post, confirming that they are in a relationship. It wasn’t a total surprise—Tiffany and Luo Jin did, after all, collaborated in four dramas together and rumors about their offscreen relationship have swirled around since Tiffany confirmed her breakup with Taiwanese actor Roy Chiu (邱澤) in early 2013. The rumors were specific, ranging from secret marriages to secret hand-holding. Tiffany and Luo Jin denied all, insisting that they were single. Pressures of the entertainment industry had forced them to go underground. Tiffany and Luo were already dating by the time they came together for their fourth drama Princess Weiyoung <锦绣未央>, which is currently airing in China. Insiders said they briefly dated when they filmed Agent X <X女特工> three years ago, but broke up shortly afterwards. Princess Weiyoung had reignited their spark. In a recent report released by Chinese tabloid source Quanmingxingtan, dark blurry photos of Tiffany with an unidentified man—now known to be Luo Jin—were taken on the set of Princess Weiyoung earlier this year. 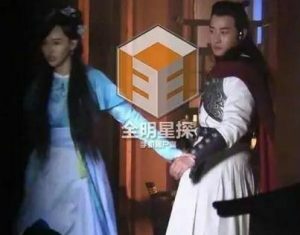 The paparazzi also managed to snap a photo of Tiffany holding Luo Jin’s hand while they were filming the drama in studio, but this was the only paparazzi photo they published in their report. Tiffany was closely followed while she was shooting Princess Weiyoung. In their report, the paparazzi said they saw Tiffany meet up with a mysterious man one night; although they couldn’t identify who the man was at the time, it can now be confirmed that the man was indeed Luo Jin. Tiffany and Luo Jin spent two nights together during the paparazzi’s observation. In the first night, Luo Jin, dressed in all black, sneaked into Tiffany’s hotel room with the help of her assistant. Luo Jin did not leave the room until the following day when they had to resume work for Princess Weiyoung. Luo Jin returned to Tiffany’s room that night. did he have a script in his hands?